Arched Building on left is Star Theatre circa 1920's. 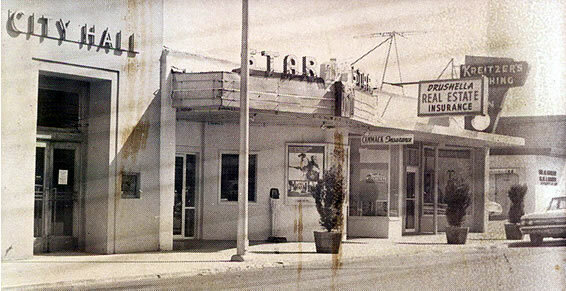 to Star Theatre before it is torn down. 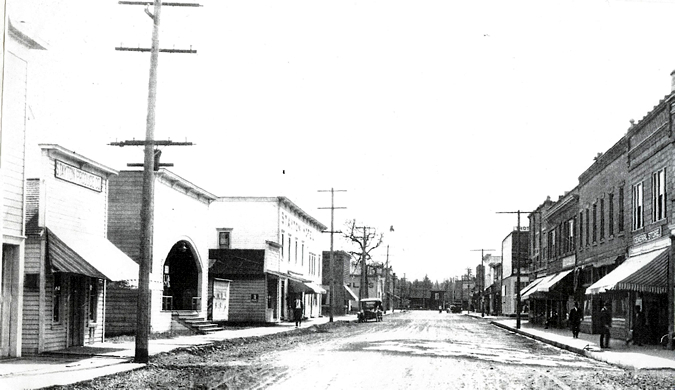 City Hall when it moved from above Stayton Mail next to Star Cinema after Bank vacated the building that was built in place of the previous Star Theatre. Eventually Camack Insurance, Drushella Real Estate Insurance and Kreitzer's Men's Clothing moved out and the City Hall remodeled the building in it's present day location, which included the take over of the Star Cinema concession area and office. I'm assuming this happened during the time when the City Hall bought the complex including the theatre and most likely the theatre was closed during that time before somebody, such as Jim Lane came in to run the theatre. The Police Station moved into its present location in the City Hall building. Kreitzer's Clothing became Jensen-Kreitzer's Family Clothing which moved just across the street.